Please drop me a line at graindemusc at gmail dot com to give me your address. 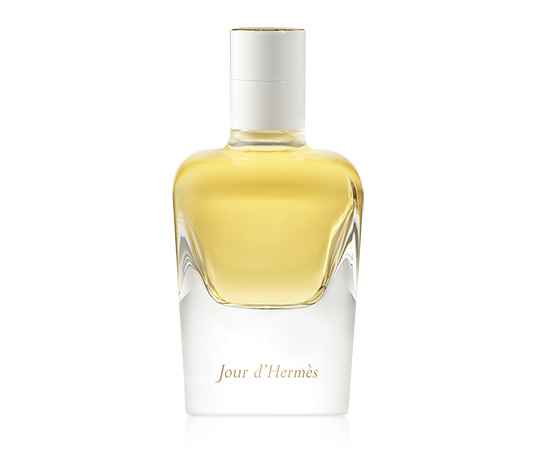 Don’t forget to state “Jour d’Hermès” in the header and to tell me your pseudo. And remember I’ll be asking for your impressions of the flowers you “read” in the fragrance, which I will publish next January. I was happy to see that fellow bloggers whose opinion I value – Victoria of Bois de Jasmin, Robin of Now Smell This and Octavian of 1000 Fragrances – were also embracing Jour d’Hermès, since like a great many people in France I actually care for Hermès and root for it as one of the few major luxuries houses upholding its integrity and standards. By hiring Jean-Claude Ellena in 2004, Hermès has dealt with its heritage as a perfume house in an interesting way, since Ellena claims a filiation with Edmond Roudnitska who signed Eau d’Hermès back in 1951. While maintaining almost all of its earlier fragrances, Hermès clearly opted for a re-foundation that integrated the concepts pioneered by niche in the 90s, namely “landscape captures” with the Jardins series and materials-driven composition with the Hermessence (it was the second big house to offer this type of exclusive line, one year after Armani Privé). Of course, Ellena had been a major player in developing both concepts. His ground-breaking Eau Parfumée au Thé Vert for Bulgari, initially a submission for Fahrenheit, may well have been the first mainstream fragrance not to be conceived as an extension of a male or female persona (though the original ads show a skinny-dipping couple in the throes of passion). And through his Bois Farine, the first scent commissioned by Pamela Roberts at L’Artisan Parfumeur for a travel-inspired series, he pioneered the “landscape in a bottle” idea. Thanks for picking my name. I must admit that I managed to try it in the meantime, and didn't smell flowers at all, but only lychee (must be skin chemistry)... so maybe you want to make somebody else happy? Hi Bee, thanks for giving someone else a chance, I'll put in another name... I wouldn't say skin chemistry -- though perfumes do develop differently on different skins, if they went that much all over the map they'd be badly made. I tend to think it's the way we put together certain notes and associate them with something in our olfactive database. Often, once we've zeroed in on an effect, that's the way we'll go into the fragrance. Lychee is pretty much related to rose, actually, and there are fruity-juicy notes, so if you smell it, it's there! Bee, there's definitely a difference in development from one skin to another, as anyone who's attended a group-sniffing or a press presentation can verify. I guess it's a bit of both: personal references and impact of skin. Not to mention temperature, humidity and location. Perfumers often say when they present a submission to a client, they're surprised to find it smells different than in their own office.